BU has a Webcam pointed right at the bridge. It's not a livestream, but it's frequently updated. They're red in all directions, Margo Romanowski reports. 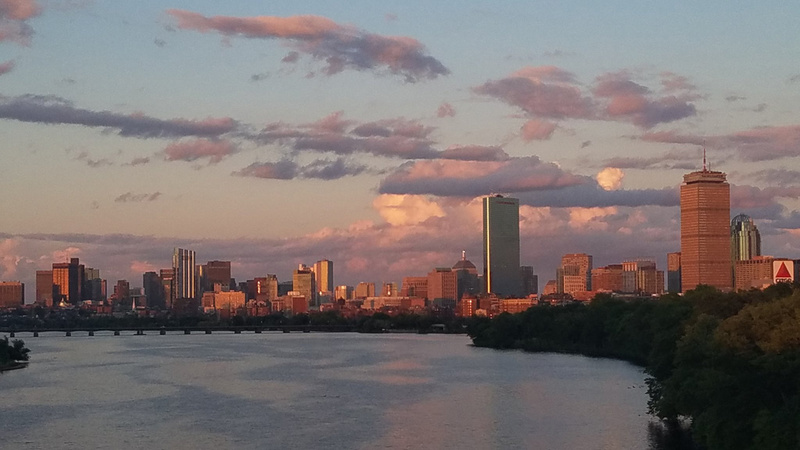 Todd Cosentino reports one of the advantages of early-morning bike commuting is the view from the BU Bridge. Read more. Unsettled plate. 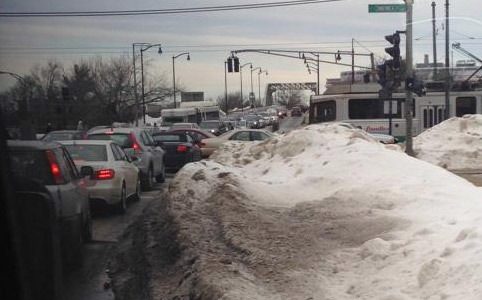 Photo via Jacquelyn Goddard, MassDOT. 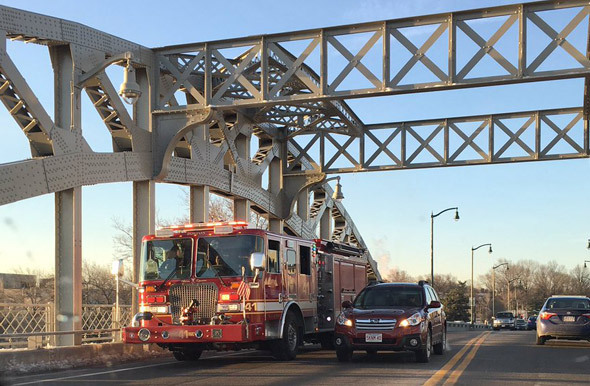 Boston firefighters are at the Comm Ave. bridge inbound over the turnpike and the Worcester Line train tracks, where some large steel plates over a construction zone have settled too much, leading to concern they might give way. MassDOT engineers have been requested to the scene. Boston University, which has a campus split by the infamously decaying span, has hired a company that sets up cameras to record construction jobs to time-lapse the heck out of the bridge now that the state has begun to replace it (how is the shrunken turnpike under the bridge doing?). 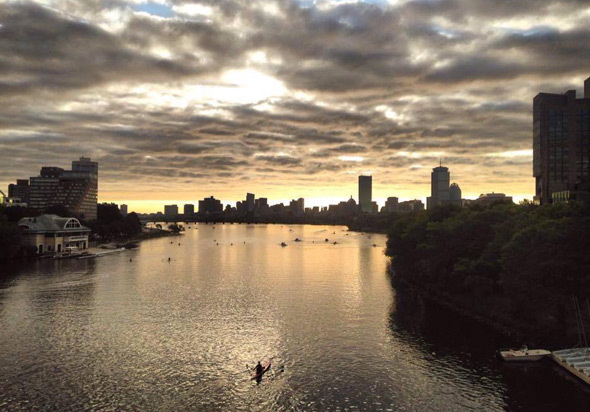 Luisa LaSalle watched the sun come up over the Charles from the BU Bridge this morning. Firefighters, police and EMTs rushed to bridge. Photo by Rodney French. Alive, around 7 a.m., according to Northeast Fire Alert. 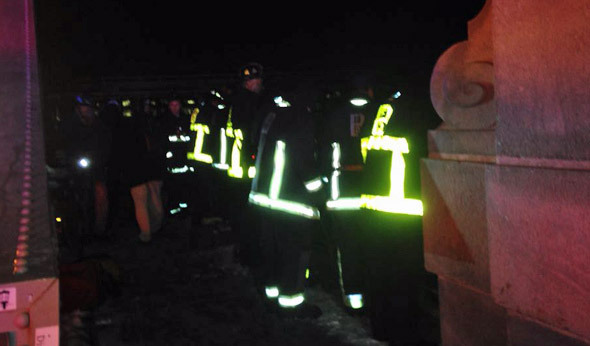 First responders on the BU Bridge. Photo by Greg Hum. UPDATE, 7 p.m. A thermal scanner mounted on a State Police helicopter found no evidence of a body; firefighters began packing up to leave. Around 6:15 p.m., based on a phone call. Police and firefighters from both Boston and Cambridge are on scene and searching the Charles River. 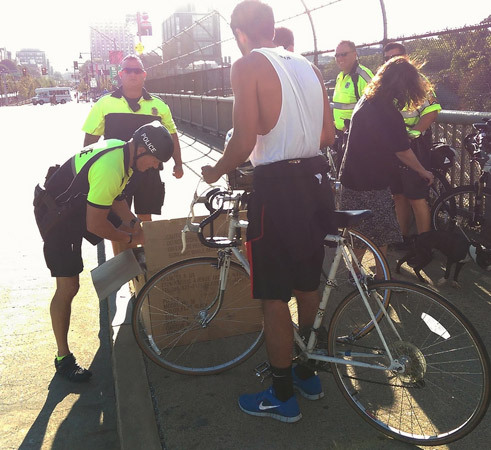 Turlach MacDonagh reports police were giving out free helmets to bicyclists without them this morning on Comm. Ave. at the BU Bridge. Photo copyright Turlach MacDonagh. Posted in the Universal Hub pool on Flickr. Found this object epoxied to the BU bridge. Assume it is a public art kind of thing. Wondering if anyone know what the deal is? Jonathan Levitt give us a taste of the chaos around 9 when the lights went out on Comm. Ave. by the bridge. First responders looking down from BU Bridge. Photo by Rodney French. BU Bridge over Storrrow Drive female just fell off the bridge down to storrrow serious injuries.emergency responders scrambling. The 22-year-old woman suffered serious injuries. She was conscious and alert when transported to Brigham and Women's Hospital. Whether the fall was accidental or intentional remains part of an ongoing State Police investigation. Ari Ofsevit enjoyed the view of the fog from the BU Bridge this morning. Large numbers of BPD officers descended on the Esplanade and the BU Bridge shortly after 4 p.m., when a 911 caller reported a man in camouflage running around near the bridge with a rifle. Cambridge Police sent some officers to their side of the bridge as well. In fact, it turned out there was a whole troop of men running around the Esplanade with rifles - but they turned out to be BU ROTC cadets doing some training with fake rifles. 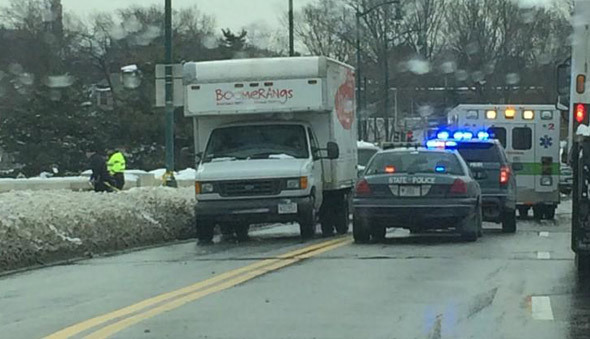 Unluckily for him, Brian Clarke wound up right behind this tanker truck around 1 p.m. on Storrow Drive. Luckily for him, the driver stopped before proving that you can't drive a truck under a train bridge under a car bridge while a plane flies overhead. Ed. note: Even though it doesn't seem like the tank is filled with anything flammable, can you imagine how long it would take to clean up the mess after the top of the thing was torn off? Boston Ward 4 Dems snapped the latest BU Bridge/Grand Junction casualty: A truck whose driver apparently and rather suddenly lost the ability to read, right in the middle of the evening rush hour today. On the eastbound side, at least.